I recently watched the Japanese movie, The Snow White Murder Case. Overall, I found it interesting. The movie is a murder mystery type of story, but it is told through multiple perspectives where one of the characters is an entertainment reporter investigating on the incident for his TV network to broadcast. We don't see anything from the police's point of view. There is a high focus on social media with Twitter being the main tool that is used in the movie. The movie is about the murder of Noriko Miki who worked at a cosmetics company. The entertainment reporter, Yuji Akahoshi, starts to investigate about the incident through an university friend, Risako Kana, who happens to work at the same company as the victim. The primary suspect for the case as told from Risako is Miki Shirono, another co-worker that works at the same cosmetics company. That is because Miki disappeared the night of the murder. I recently watched The Boy and the Beast. 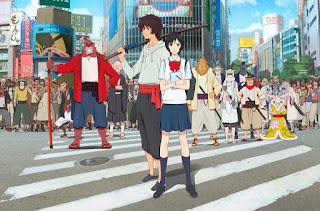 I don't think I can go into too much of the details to make it a full review of the movie, but here are my thoughts on the Japanese animated film. I went to Fan Expo this year on Saturday, September 5, 2015 which runs from September 3-6. I didn't plan on going for the whole weekend, so I didn't think it was necessary to get the weekend pass to try to go on both Saturday and Sunday. Fan Expo happens every year near the end of the summer in Toronto at the Metro Convention Centre right beside the CN Tower and the Rogers Centre (formerly known as the Skydome). It's a place where Sci-Fi, Horror, Comics, Anime, and Gaming fans come together to hang out, cosplay, buy merchandise from retailers or from the artist alley, play some games, and/or attend panels. With that said, I don't believe you could see properly see everything on just one day but Saturday had a lot of the events so I decided to go when it was the busiest as usual. This wasn't my first Fan Expo that I went to as I think I went in 2012 and 2013. I don't remember if I did go in 2011... I have no recollection so let's leave it at that. The InkCase+ is an 3.5 inch e-ink device connected via Bluetooth to your Android smartphone made by a company called Oaxis that used Kickstarter to crowd-fund their project. The main goal of this device is to look at your notifications, reading ebooks, answering phone calls, and so on without needing to turn on your phone. Therefore, it won't decrease the battery of the phone as much if you had it on. They also marketed a specific case for the InkCase+ and phone so that it makes it more convenient to carry with you. You can also use the pouch to carry the InkCase+ separately. Since I am writing this post, the project was successfully funded on August 14, 2014.